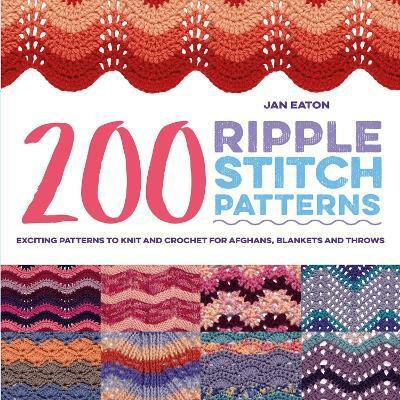 A new edition of the popular stitch book by internationally renowned needlecraft and textile designer, Jan Eaton. In this collection, create beautiful fabrics with variegated zigzags of colour and pretty ridged effects that are perfect for afghans, throws, baby blankets and even wall hangings. This easy-to-use book features 200 colourful ripple stitch patterns to knit and crochet using a range of techniques, from traditional Shetland lace stitches to modern textured pattern. Each stitch features a detailed photograph, clear instructions and suggested colour variations; Jan's book also includes guidance on planning projects, choosing yarn, making and combining swatches, and finishing edges, along with an easy-to-follow refresher course on knitting and crochet basics. There is even the addition of five beautiful projects inside for you to knit and crochet, allowing you to see the myriad creations that can be made with the stitch patterns. With so much inspiration to help you in one handy guide book, prepare to while away hours knitting and crocheting your dream designs with this essential and invaluable directory that's perfect for new and familiar needlecrafters everywhere. Jan Eaton is known internationally for her specialty in needlecraft and textile designs. Since finishing her training at Goldsmiths College in London, Jan has worked as a freelance designer showcasing her embroidery, crochet, knitting, and textile painting designs in various UK and European magazines. Jan has written more than 10 needlecraft books.